Born in Czechoslovakia and based in New York City, Pavel Zuštiak is a director, choreographer, performer, and sound designer. 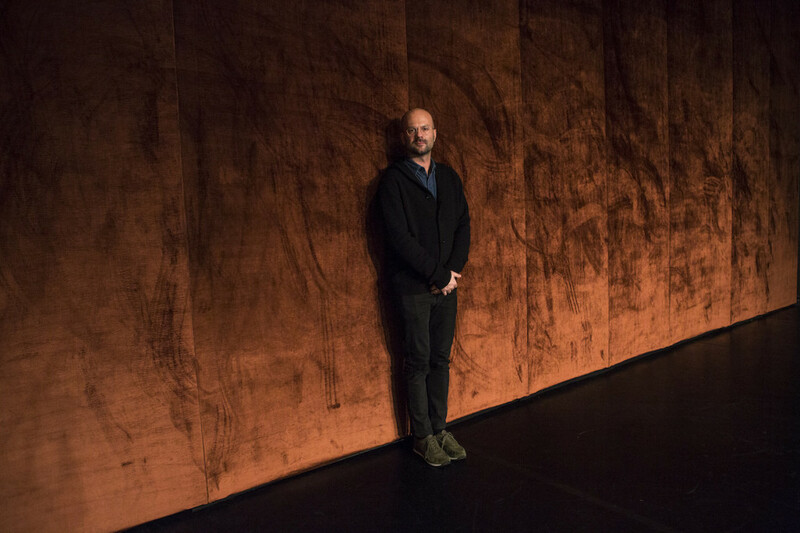 He is also the Artistic Director of Palissimo Company which he founded in 2004 and the winner of the 2015 Juried Bessie Award for Outstanding Emerging Choreographer. This weekend, the Walker will present the Midwest Debut of Zuštiak’s newest work Custodians of Beauty, co-commissioned by the Walker Art Center, New York Live Arts, American Dance Institute, and Legion Arts. In Custodians of Beauty, Zuštiak questions where beauty is found and whether it needs our defense. With this piece, Zuštiak moves away from his usual large scale productions by focusing on a more minimalist approach to choreographing dance—picking away at the subject to find, perhaps, the truth of what beauty is. I had the honor to talk to the artist himself over a cup of coffee and what follows is a series of questions and responses to get a better idea of who Pavel Zuštiak is as an artist, and how he went about creating Custodians of Beauty. Ben Swenson-Klatt: So glad that you are able to sit down and talk! I thought we would start out with a few questions to get to know you. What inspired you to become an artist? Was there a particular moment or artist that inspired you the most? Pavel Zuštiak: I was born in former Czechoslovakia in an area that is now Slovakia, and I was always attracted to the theater world as far as I can remember. I built my own lighting system for my homemade puppet theater when I was very young, then acted and sang on a very popular TV series starting at age nine. Early on I also studied piano—I almost went to a conservatory to study that—and then things kind of shifted; when I was 12, I started to dance by accident. That’s actually a funny story. This was around the time when Flashdance and Dirty Dancing had just come out, so dancing was very popular and everybody was looking for studios to dance in. Slovakia has a very rich tradition of folk dancing, and every town had its own specific folk dance vocabulary and traditions. A schoolmate of mine wanted to go audition for a folk dance company, but he didn’t want to go alone and asked me to go with him. I said sure. We got to the cultural center where the audition was being held, but he messed up the dates and we ended up at a modern dance company audition instead. Everyone was in tights except the two of us! We both got in—he quit after a month—but for me it was a revelation. I was fascinated by the ability of dance to touch upon something that goes beyond words and yet can be very specific in communicating. One particular moment made me recognize art making could be a vocation, and that was meeting Pina Bausch and seeing her work. She came to my hometown, Kosice, in Czechoslovakia in 1987 and rehearsed and performed at the cultural center where the dance company I was a part of resided. We observed her rehearsals, interacted with her, and eventually saw two of her seminal pieces, Café Muller (which she performed in) and The Rite of Spring. This experience blew me away and revealed how powerful dance and theater can be. It was truly a pivotal moment for me. Later I went to the School for New Dance Development in the Netherlands. Seventeen years ago I moved to New York, and that’s my journey. But I would also say that very early on, because of all these different genres that I had explored, to me, in a theater performance, one is not more important than the other, so rarely I see set, music, or lighting just as a decorative element but as an element that can push the narrative of the piece. Swenson-Klatt: You seem to be really aware of the sound and lighting, and I think you even mentioned that you are playing with scent in this production? went through all this stuff including clichés, and someone brought up the scent of a rose. Swenson-Klatt: And other scents,like perfumes? Zuštiak: Yes, and I was reminded of how powerful scent can be in transporting you to a place or time in a very immediate way. This is the first show where I am playing with that, and I plan to explore that further in my next project, where I will be collaborating with a scent artist. So this is dabbling into something new. Swenson-Klatt: Could you talk a little bit more about the collaboration you have with lighting designer Joe Levasseur, set designer Simon Harding, and sound designer Christian Frederickson, and how they are integral to Custodians of Beauty, in terms of pushing the narrative through transitions? Zuštiak: I usually start with a question or dilemma around a certain subject or theme as an opening question or conversation, not only with the designers but also with the performers, who are equally contributing artists in the room. Out of those conversations and out of contributions from all of us, we start to look at a palette of possibilities. Ideas, scenes, and events start to emerge, and then at a certain point I end up with a series of… I call them images, but I don’t see it as a static moment. I start placing them in a certain order, looking dramaturgically at what kind of trajectory the show could have, and then I start shaping individual images or scenes, and their progression, throughout the show. In terms of my direction, often I come with an image or I come with a clear proposal or direction of a scene, and sometimes I know what function a transition or scene has and that’s my direction to designers, to problem solve. But it’s a lot of back and forth, a very organic process. I have worked with Christian, the composer, on five productions, and Joe Levasseur is the exclusive lighting designer that I have worked with since living in New York, so at this point they pretty well understand my aesthetic. I think we are also at a place where, we were joking, we can be like an old couple: we know when to fight over something and when to let go. Swenson-Klatt: You bring up seeing the overall choreographic process as visual or image-based. Do you have a connection to visual arts or a way that the visual arts play into making movement? Zuštiak: I think there are choreographers who are creating or editing through kinesthetic feedback, and that’s how they shape and edit the work. For me, it’s seeing the work and seeing all the elements together, and I am more and more curious in reduction: how far can I push reducing expressive modes into a simple statement or gesture that would hold much more than you are seeing? Like reduction in cooking—you taste something but there is a depth—many different ingredients that went through a long process to get to that point. Or like a capsule that locks together complex layers, or a statement. I like to see how far I can push that without losing the intensity of what goes into it. Swenson-Klatt: And the way that all the different elements that came together. In other interviews you’ve discussed the research that went into this piece, like how its title is pulled from a 2009 address by Pope Benedict XVI when he met with artists at the Sistine Chapel, as well as the influence of Alva Noë’s book, Action in Perception, and Susan Sontag’s essay, “An argument about Beauty.” Could you talk about your research? Zuštiak: The original speech by the pope already touches on some references from history. He quotes Plato, for example, who talked about beauty as something that shocks us out of ourselves, which I find fascinating, as a way of being disarmed as an audience member, which also leads to a certain loss of narcissistic vision and makes you aware of larger issues or gives you a sense of humanity. In the show there a few moments where we are eluding to this sensibility of breaking the fourth wall, to making the audience realize that we are here in the same room, that this is something happening collectively. I came across an article with the same title in a wonderful Dutch magazine Works That Work, published by a Slovak editor, Peter Bilak, which mentions the pope and his speech to leading art makers of the time—his insistence of holding onto beauty as something important in their art making. I was perplexed that this was high up on his agenda, although the relationship of the church and art world is nothing new. That led me to research beauty throughout contemporary art history, and I realized how problematic this subject matter is and how in certain parts of the art world, beauty has become almost taboo. Often we feel more comfortable talking about something as interesting rather than beautiful, which Susan Sontag states at the end of her article as an argument for the definition and existence of beauty: “If you are watching a sunset it would be strange to say it is interesting rather than beautiful.” I find that when we say something is beautiful we are laying our cards on the table, while when saying something is interesting we are holding them close to our chest. Zuštiak: I think the resistance towards beauty also comes from its associations, for instance as something being pretty or as something that has to be symmetrical, these preconceived ideas of what beautiful means. Who defines that? I think the question itself has also become controversial: who is in charge of the definition of what is and what is not beautiful? Although the pope is approaching the artists as custodians, the title Custodians of Beauty for me is more of a question mark, i.e. who are the custodians? Is it the audience member? Is beauty in the eye of the beholder? Is it the curator, who presents the work, is it his or her responsibility? The questions that this subject raises are challenging and lack straight answers, and I found it to be a fertile ground for a new work. Swenson-Klatt: In her article, Sontag brought up the feminine connotations of beauty, and of course in mainstream media beauty has almost become attached to the feminine. Did you play at all with gender? Zuštiak: Yes, there is one scene that acknowledges that. I am acknowledging feminine beauty as an image or association, although the notion of beauty as the cover of a fashion magazine often relating to a product was not something I was going for in this piece. I was more interested in beauty that is at the edge of terror. You know you can be in the presence of a tornado and it can be a beautiful sight, but you are also at the edge of something that can consume you. I believe there are artworks that can produce the same effect. Swenson-Klatt: Is there a piece of artwork that you find beautiful? That’s probably a big question. Zuštiak: I’m sure there is. For some reason I’m going to music. I’m thinking of the work of Arvo Pärt, music I find incredibly simple yet immensely beautiful. Swenson-Klatt: It’s a hard question! But maybe something for everyone to think about when they are approaching this piece. Zuštiak: And by saying something is beautiful, there is also judgment, so that is part of the show, where—I don’t know how much I want to say because people should come and see—basically, it’s a subjective matter, something can be witnessed by two people but they can have polar opposite experiences. So it’s also touching on that; it’s a subjective thing relating to judgment. And that leads to perception, which leads to Alva Noë, who talks about perception as not something that happens to you but something that you do. So he is talking about perception as an active engagement with what you are seeing. And for me, not just with this show but for any show, the audience is the co-creator of the experience and it is a live thing. When that meets with what we are proposing and comes into a conversation, I feel like that’s what releases the magic of a theatrical experience, something unpredictable but alive. Swenson-Klatt: It almost seems that by setting the context with the term beauty that you are asking the audience to be active participants and to make a decision about what they find beautiful. Zuštiak: And I’m hoping that it’s not just about this show. I’m thinking of another performance that we did in a public space. It was called Halt! and was presented in the terminal of the Staten Island Ferry in New York City. There were three performers who were among the people that accumulated to get on the ferry, and after one of the shows I got an email from someone who came to see it, and she was saying that suddenly everything in that terminal, in her eyes, was choreographed. She said, “I left the terminal and it continued. I was on the subway and it felt like everything was a dance.” So her perception shifted and I would hope that this show could also shift people’s perception. There are many things in the show that look at subtleties, the mundane, and when you start looking at things for an extended period of time or from a different angle, you start to see things differently, so that’s also what I am hoping to achieve with the show. Swenson-Klatt: Do you have any last words as the audience prepares for the show? Zuštiak: I feel like non-dance audiences come to a dance show believing that there is a certain kind of experience they should be having rather than just having their experience, so I would say, go in with an open mind; have an experience first, and then start analyzing what happened rather than coming in with an analytical mind at the start of the show. The biggest compliment I received for my work was from an audience member who said, “I did not understand it but I know what it was about.” I think dance is not the best medium at telling stories but an amazing medium to tell stories in its own language. Pavel Zustiak’s Custodians of Beauty will be performed Thursday through Saturday, October 20–22, 2016 at 8 pm in the McGuire Theater.